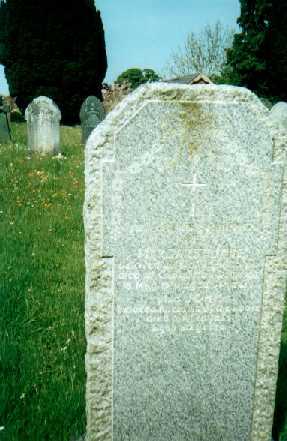 The view of the grave-stone is from the south. 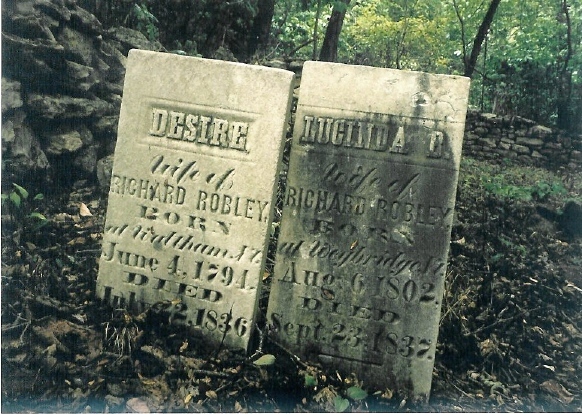 Other faces record John Robley (1828-1891) and Isabella (1830-1907). Contributed by John Robley, Lesmurdie, W. Australia. 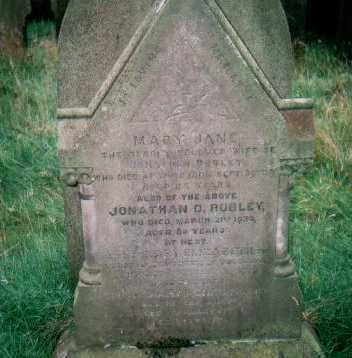 Gravestone of John Robley of Manchester (1792-1875) in the Egremont, Cumbria Cemetery. 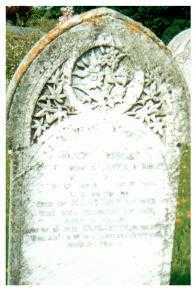 His wife Elizabeth appears on the stone also, although she is buried at St. Saviours, Chorlton upon Medlock, Lancs. with her Aunt Hannah Robley (Sterndale). Daughter of Rev. I. And Mrs. This stone is on the wall of St. Kentigern's Church. 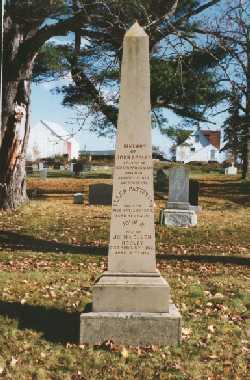 Mary (Gaskarth) Robley was the wife of the Rev. 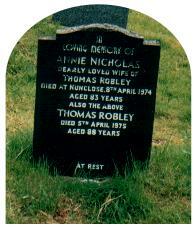 Isaac Robley of St. John's-in-the-Vale, Crosthwaite. 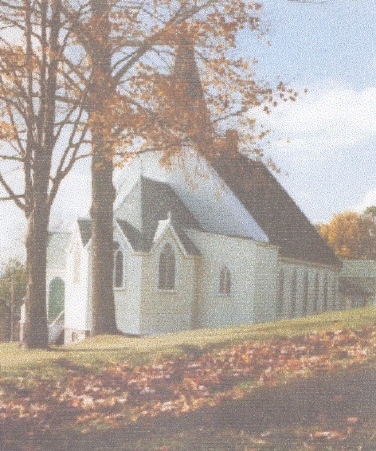 Her husband was buried before the altar of the Church of St. John's-in-the-Vale, where he served as curate for 40 years (1732-1772). His Wife Who Dpd. This Life Feby. 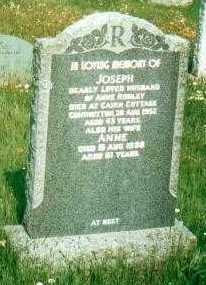 These seem to be the children of Mary (Gaskarth) Robley's eldest brother, John. Mary had 6 younger siblings: Ann, Gawin, Sarah, Jane, William and Joseph. 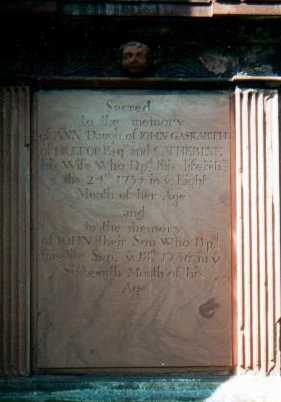 Her father (also a John Gaskarth) died in 1730. 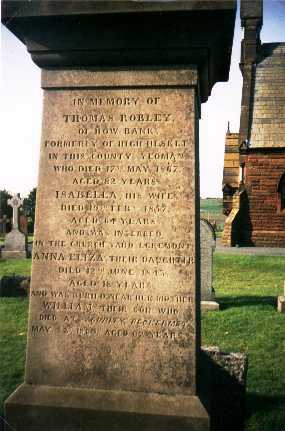 These are Thomas and Elizabeth Robley of Scarrowmanwick, and four of their ten children. Richard and James died young, and Elizabeth and Isaac did not marry. The dates have been taken from Parish Records. 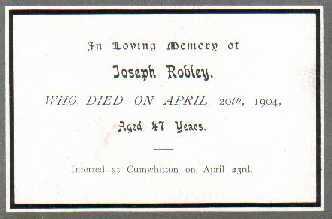 Joseph Robley was the eldest son of John Robley and Margaret Jane McKitterick. He married Anne Ferguson. 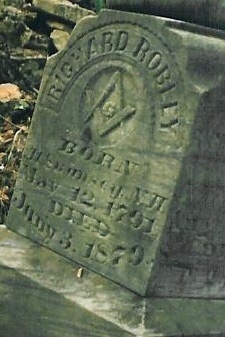 Christopher Robley was the second son of John Robley and Margaret Jane McKitterick. 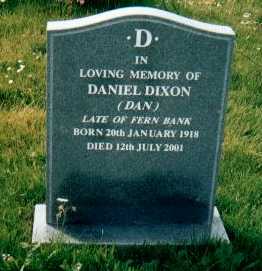 He married Elsie Shaw. 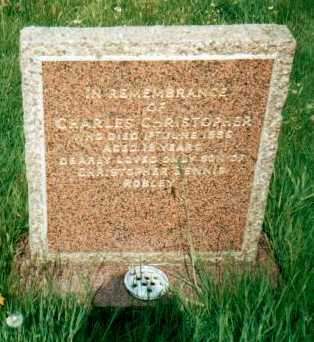 Charles was the grandson of Christopher and Elsie Robley of Scarrow Hill. 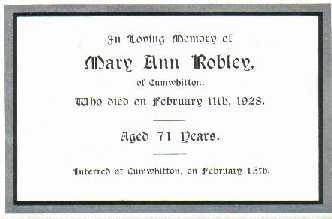 Maud Mary Robley was the daughter of Joseph Robley and Mary Ann Lowis. Maud and Thomas had 5 children: Joseph, Mary, John George, Thomas and Daniel. 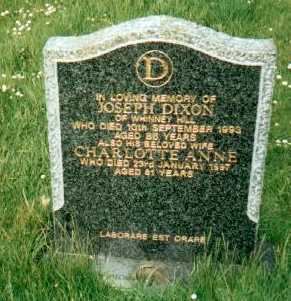 Joe Dixon was the eldest son of Maud Mary Robley and Tom Dixon. 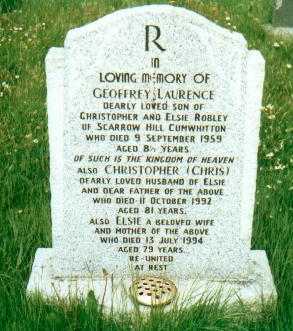 He was Churchwarden of St. Mary's Church, Cumwhitton for many years. 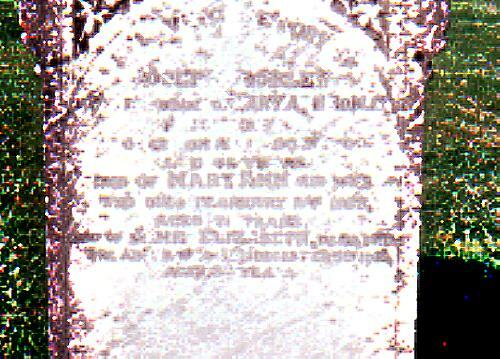 Joseph Robley (1856-1904), Mary Ann Robley (1857-1928), Jane Elizabeth Robley (1880-1916). 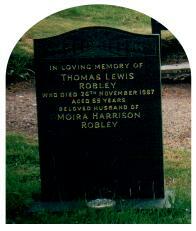 Mary Ann Lowis (Robley) was a Blenkinsop (Blenkinship) on her mother's side. Her mother was Jane Blenkinsop of Haresceugh Castle. 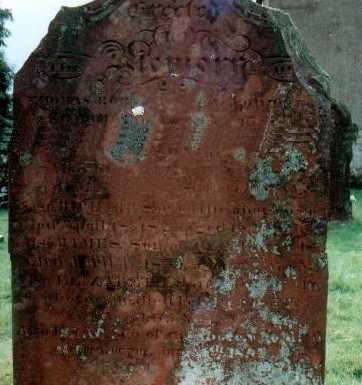 The Blenkinsops on the Renwick gravestones are descendants of Jane's brother, Robert. Notes. 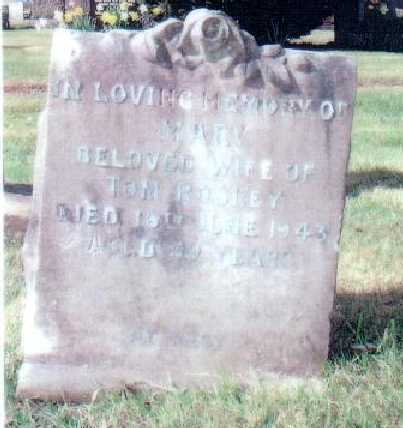 Thomas Robley married Jane Carruthers on 15 Sept., 1811 at Wetheral Church. 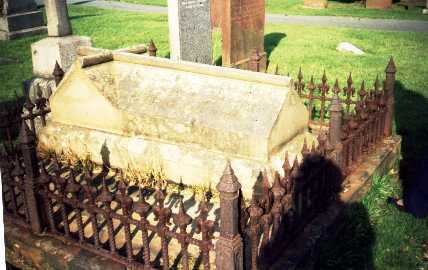 They had 7 children: Robert (c.12 Jul.1812), Thomas (c. 3 Jul.1814), Joseph (c. 3 Mar.1816), Elizabeth (c. 17 Aug. 1817), John (c. 10 Jan.1819), Richard (c. 23 June 1822), Jane (c. 20 Oct. 1824). Jane was christened 2 days after her mother's burial. 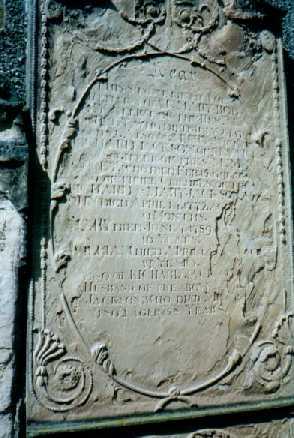 Notes.This is the grave of William, the son of Thomas of Newlands/Scalesceugh and the grandson of Thomas of Newlands (d.1690). We know that John went to Carlisle Grammar School from the following entry: Robley, John (adm. Aug.9th 1762), only son of William Robley of Wetheral, co. Cumberland, dyer (tinctoris). Left before Xmas, 1764. Notes. 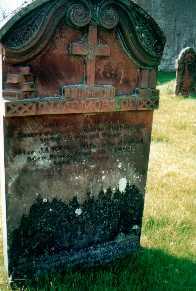 The death of Richard's father,brother and sister are recorded on the headstone above this one. William lost other children as infants. 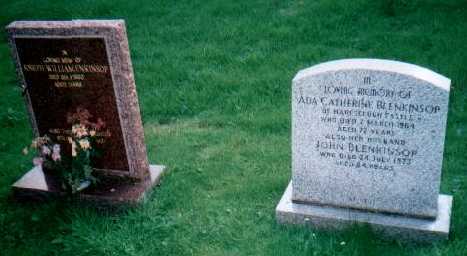 Alma Rasheed, who researched these transcripts at the Castle, Carlisle pointed out that the above 2 gravestones (nos. 444 and 445), were surrounded by 4 other stones which had fallen (443, 446-448). These too may have been Robley graves. 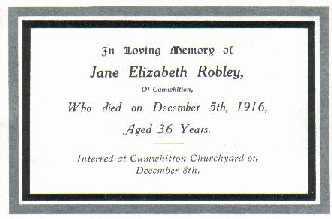 AUGUSTA JANE (PENFOLD) ROBLEY/ ENGLAND/ Robley nata Penfold/ Giovanna Augusta/ Guglielmo/ Inghilterra/ Firenze/ 28 Novembre/ 1868/ Anni 59/ 1026/ Jane Augusta Robley, l'Angleterre, fille de Guillaume Penfold/ GL23777/1 N� 401 Burial 01/12 Rev Pendleton/ HERE RESTS IN PEACE AUGUSTA JANE ROBLEY WIFE OF CAPTAIN J.H. 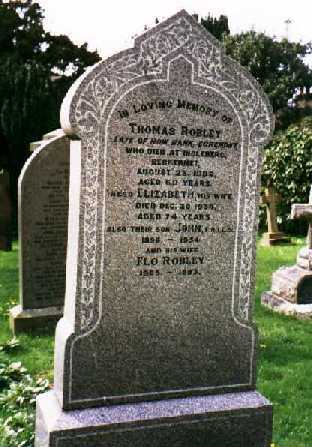 ROBLEY WHO DIED AT FLORENCE 28 NOV 1868/ BLESSED ARE THE PURE IN HEART FOR THEY SHALL see GOD/ MATT CV. V8. Augusta Jane (Penfold) Robley was best known for her book, "A selection of Madeira flowers". 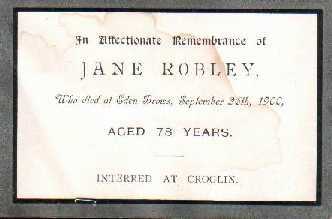 Her husband Captain John Horatio Robley was the great grandson of Rev. 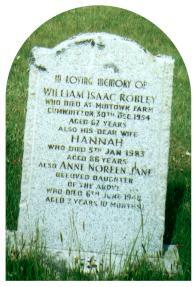 Isaac Robley of St. John's-in-the-Vale. Photographs taken 1999 & contributed by Garry Griswold. 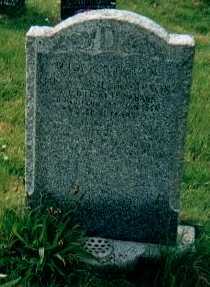 The graves are in a family plot off the main road north of Eldred, Greene County, Illinois. The site has a stone wall surrounding it. Desire's maiden name was Griswold; Lucinda's maiden name was Brewster.